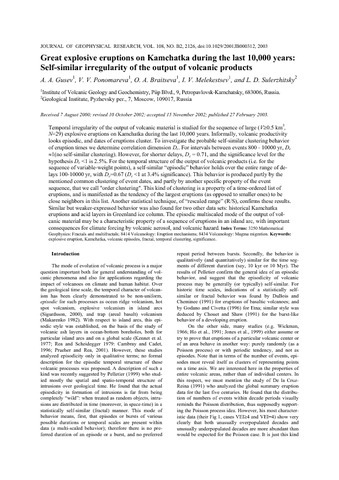 This study presents data on the geochemical composition of boiling mud pools at the Mutnovsky volcano. The physicochemical characteristics of the pools and the concentrations of major, minor and trace elements in pool solutions vary widely. A comparison of the geochemical compositions of host rocks and solutions indicates that leaching from rocks is not the only source of chemicals in thermal solutions. Geophysical studies reveal the inner structure of thermal fields, which reflect the shapes of the underground reservoirs and feed channels. 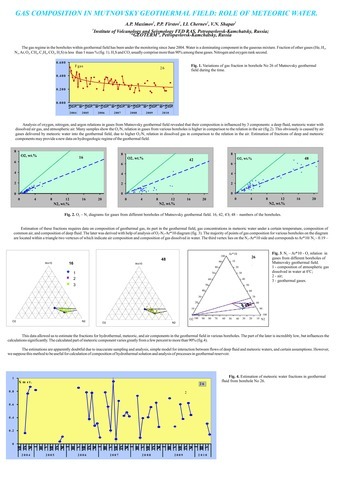 Using geophysical methods (electrical resistivity tomography and frequency domain investigations), it was shown that the vertical structure and complex geochemical zonation of the feed channels leads to a high contrast in the compositions of the mud solutions. These findings answer questions about the origin and composition of surface manifestations. 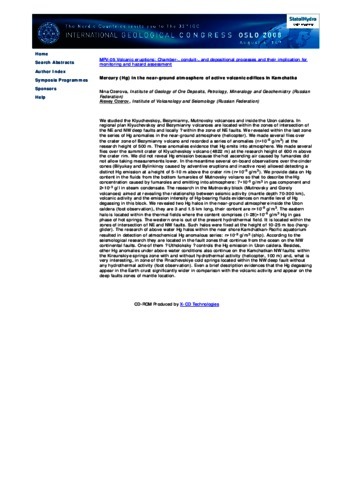 To elucidate the mechanisms of solution formation, an attempt was made to describe the magmatic fluid evolution and the resulting mixing of waters by physical and mathematical models. The model illustrates fluid migration from a magma chamber to the surface. It is shown that the formation of brines corresponding to the mud pool composition is possible during secondary boiling. 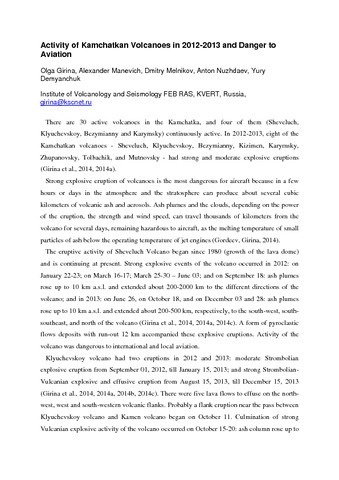 During the 2012-2013 we have measured SO2 on Kamchatka volcanoes (Gorely, Mutnovsky, Kizimen, Tolbachik, Karymsky, Avachinsky) using DOAS (differential optical absorption spectroscopy). Mobile-DOAS, on a base of USB2000+, has been used as an instrument. 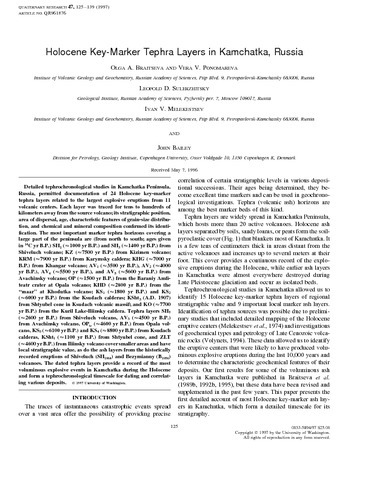 The goal of this work was to estimate SO2 emission by Kamchatka volcanoes with the different types of activity. Mutnovsky and Avachinsky during the measurements period passively degassed with SO2 emission ~ 480 t/d and 210 t/d, respectively. Gorely volcano was very active, with intensive vapor-gas activity with gas discharge rate 800-1200 t/d. During the measurements at Karymsky volcano there were relatively weak explosive events (ash plum rose up to 0.5 km above the crater) with 5-10 minutes periodicity. For this time, SO2 discharge rate was ~350-400 t/d. 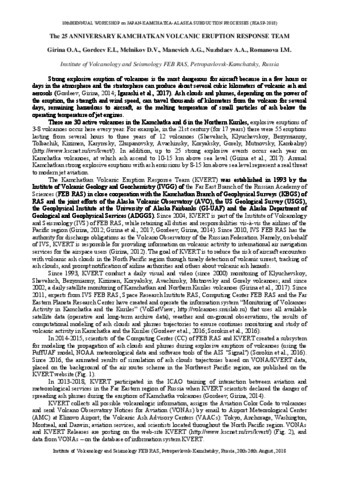 Due to the remoteness and difficulties for accessibility of Kizimen volcano, the measurements were done only once – on October 15th, 2012. 5 traverses have been done above the gas plume. SO2 emission was ~ 700 t/d. On Tolbachik fissure eruption we have measured SO2 emission repeatedly from January until August 2013. The intensive effusion of the lava flows (basaltic andesite by composition) and frequent explosions in the crater of the cinder cone were characteristic features of this eruption. The measured gas emission was from ~1500-2200 t/d in January until 600-800 t/d in August 2013. All measurements were made not permanently, but to the extent possible. 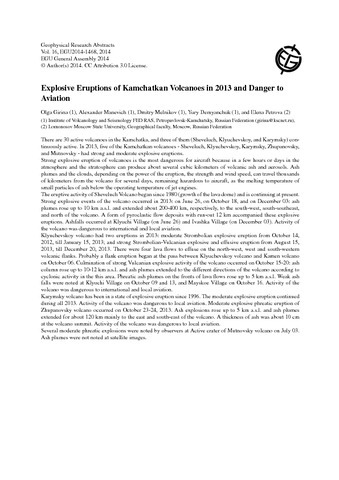 Therefore, it is difficult to make detailed conclusions on the SO2 emission on these volcanoes. 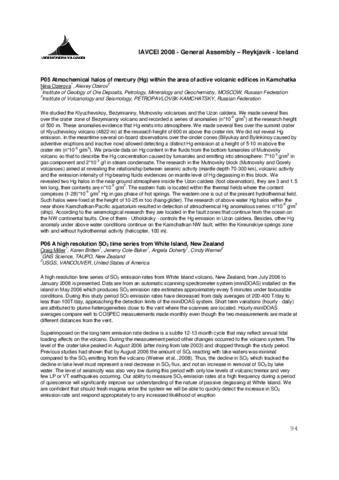 Nevertheless, this research may become a starting point for the development of the system of the constant monitoring of volcanic gases emission by the active volcanoes of Kamchatka. 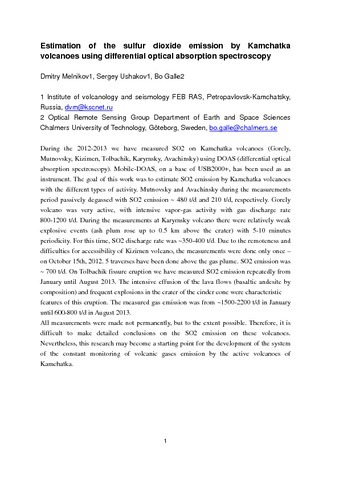 Estimation of the sulfur dioxide emission by Kamchatka volcanoes using differential optical absorption spectroscopy.